Yesterday, we saw bearish moves in bitcoin price below the USD 3,900 level. BTC/USD followed a negative trajectory and declined below the USD 3,800 and USD 3,750 supports. A new yearly low was formed below USD 3,700 before the price bounced back. Ethereum also declined heavily and broke the USD 105 and USD 100 support levels. Buyers appeared near USD 95 and later ETH/USD moved back above USD 100. On the other hand, declines in ripple were limited, but the price remained below the USD 0.355 and USD 0.350 support levels. There was a downside extension in bitcoin price below the USD 3,850 support level. BTC/USD declined below the USD 3,800 and USD 3,750 levels and spiked below the USD 3,700 level. A new yearly low was formed near USD 3,670 and later the price bounced back above USD 3,800. The price is currently (UTC 08:30 AM) flat around USD 3,860, with an immediate resistance near the USD 3,900 level. Above USD 3,900, the price could trade towards the key USD 4,000 resistance, which is likely to act as a strong resistance. On the downside, an initial support is at USD 3,800 followed by the USD 3,750 pivot zone. Ethereum price struggled to break the USD 110 resistance, resulting in declines below USD 105. ETH/USD even broke the USD 100 support and traded to a new yearly low around USD 95. Later, the price bounced back and traded above the USD 100 level. It is currently down 3% to USD 102, with an initial resistance at USD 105, above which the next key resistance is near the USD 110 level. Bitcoin cash is under a lot of pressure and it is again down around 10% to USD 125. BCH declined below the USD 140 support recently and if sellers remain in action, the price could trade towards the USD 110 level. On the other hand, BCHSV traded higher by more than 5% and it is currently trading near the USD 90 level. Ripple price declined towards the USD 0.325 support area where buyers emerged. XRP/USD recovered and it is currently trading near USD 0.342, above which the price may test the USD 0.350 resistance. 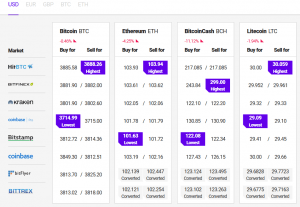 Many few small cap altcoins declined recently by more than 8% and moved further into a bearish zone, including DEX, XTZ, WAVES, MKR, AE, BTM, MITH, AION and BTS. Out of these, DEX is down around 16% and XTZ fell close to 15%. The current price action is still bearish below USD 4,000 for bitcoin. Should buyers push BTC/USD above the USD 4,000 resistance, there could be a decent recovery. If not, the price is likely to slide again below USD 3,800 and USD 3,700. Likewise, ethereum price must settle above USD 100 and move above USD 110, USD 115 and USD 120. If buyers continue to struggle, ETH/USD may extend declines below USD 95 and USD 90.